The V6 vacuum cleaner by Dysen features a simple, cordless handling and powerful suction. With the Dyson Digital Motor V6, the vacuum cleaner is three times more powerful and efficient than common motors. Two cyclones work at the same time in two radial tiers, in order to increase the air flow and to be able to absorb even more microscopic dust particles. A new filter provides for cleaner exhausted air while hoovering - ideal for allergy sufferers. The electric brush across the entire width of the cleaner head with powerful motor, stiff carbon fibres and nylon bristles allow high dust absorption specially on carpeted floors. The vacuum cleaner is usable for up to 20 minutes in the normal mode and up to 6 minutes in the high performance mode. The nickel-manganese-cobalt battery thereby allows a steady consumption of battery power, as well as a fast loading time of 3.5 hours - 3 times faster than other batteries. Hard to reach corners and spots can be cleaned flexibly thanks to the detachable wand and the 2-part combi nozzle and extra brushes of the Dyson V6. The 25 cm wide brush is suitable especially for an effective dust collection on carpet and hard floors. After the vacuum cleaner is emptied by simply pushing a button, the cordless hoover can easily be stored on the wall holder with docking station, taking up little space. Electric brush (25 cm): wider motorised brush head for use on large areas and rooms. Carbon fibres and nylon bristles for an effective dust collection on carpets and hard floors. Two levels of suction power: standard mode for light dirt and maximum mode for stubborn dirt. Wall mount with docking station: for the storage and charging of the device’s battery. 2-piece accessories: combi nozzle and crevice nozzle for cleaning hard to reach spots. Post motor filter - filter for a cleaner exhaust air. Ideal for allergy sufferers. Operating time up to (standard / maximum mode): 20 / 6min. Individual product image of the cordless vacuum cleaner V6 by Dyson. 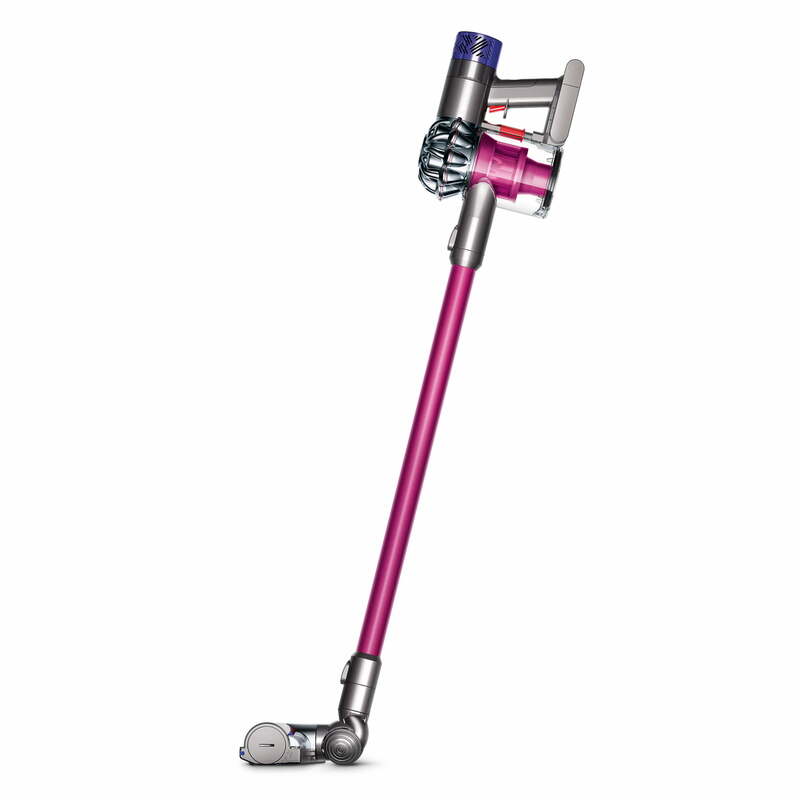 The V6 vacuum cleaner by Dyson features a simple, cordless handling and powerful suction.